Corporate Apartments, Furnished Apartments, Corporate Housing in Boulder, Broomfield, Denver Colorado and Las Vegas. Furnished Corporate Apartments, Short Term Rentals, Temporary Housing, Vacation Homes, and Executive Rentals. Just bring your suitcase and let Housing Helpers take care of the rest! Housing Helpers corporate apartments come fully furnished with all the amenities included for an enjoyable stay. 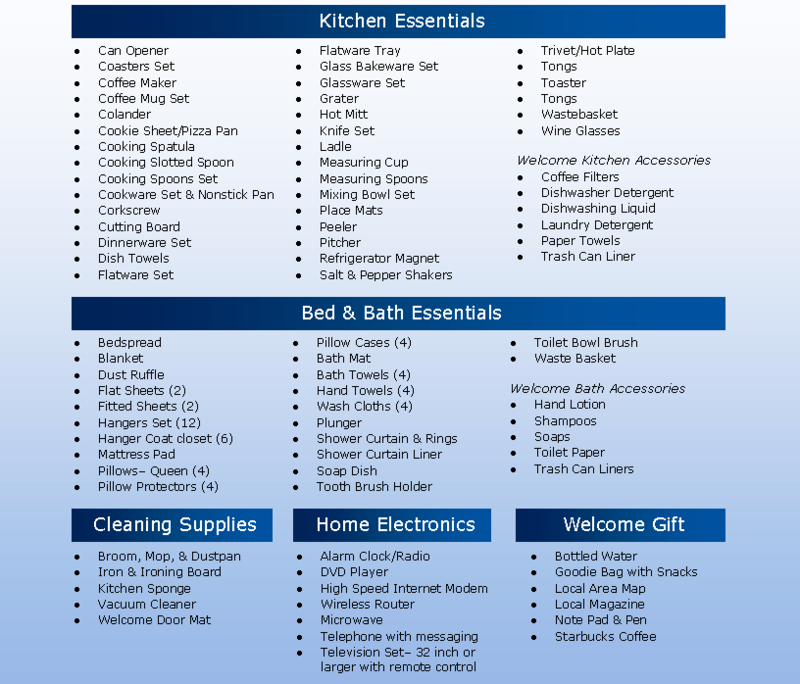 The following is a list of housewares and home electronics included in our furnished corporate apartments. Some items may vary by property, please check with your corporate housing specialist for details 303-545-6000. We can provide additional items for your corporate apartment upon special request such as:custom sized beds and bedding, portable desks and office chairs, and specialty cookware items. Additional rental charges and fees may apply. Please call our office for more information. Thank you for choosing Housing Helpers for your corporate housing needs!